PC users who have used Mac for a while would know that there is a nifty way to quickly switch between the windows of the same application. One can use the Command + ` keyboard shortcut to switch between windows of the same app. For starters, Windows 10 and earlier versions allow you switch between applications using Alt + Tab keyboard shortcut. Whenever you simultaneously press Alt and Tab keys, Windows displays all running applications as well as application windows. For instance, if you are running three instances (windows) of Notepad program, then the Alt + Tab will show all three windows of Notepad along with other application windows. You need to choose one of them in the Alt + Tab screen to switch to it. The problem is that Windows doesn’t offer a keyboard shortcut to switch between windows of the same application. For example, if multiple Notepad windows are open, there is no way to quickly switch between open Notepad windows. Sure, you can use the Alt + Tab but then it shows all running application windows (not just Notepad windows in this case), and you need to choose the window you want to switch to. That makes the switching between windows of the same application a little inconvenient. Would not it be cool if there was a keyboard shortcut in Windows 10/8/7 to quickly switch between the windows of the same application without seeing other application windows? Well, our friends at NeoSmart, have released a new application to bring Mac-like window switching to Windows 10 and earlier versions. Easy Window Switcher is a free program from the makers of the popular EasyBCD software. With Easy Window Switcher, you can quickly switch between windows of the same application without opening the Alt + Tab screen. To switch between windows of the same application, all you need to do is press Alt and ` keys on your keyboard. Likewise, you can use Alt + Shift + ` to go the other way. Remember, the Easy Window Switcher will not show all open windows of the application. Instead, it will simply switch to another window of the same application. If you are confused, on US keyboards, the ` key is present just above the Tab key and below the Esc key. 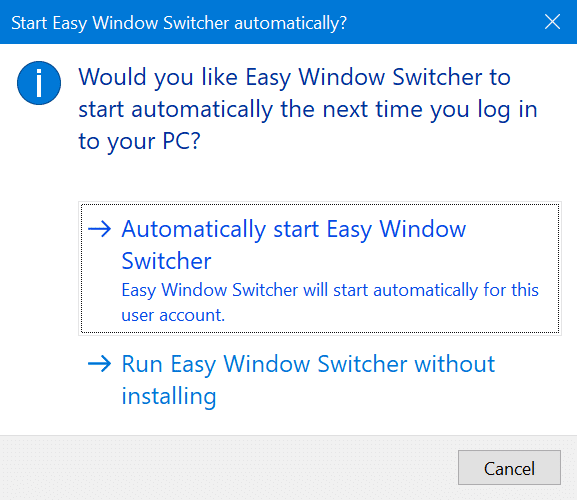 While running Easy Window Switcher for the first time, you will see the following screen with two options: Automatically start Easy Window Switcher and Run Easy Window Switcher without installing. Depending on how you want to use the program, click one of the options to continue. The Easy Window Switcher application has no user interface. Once you download and run the program, open multiple windows of the same program and then try Alt + ` or Alt + Shift + ` to check the status of the program. The download page asks you to register to download the program, but you can download the program without registering as well. Simply click the Download button to begin downloading the program.